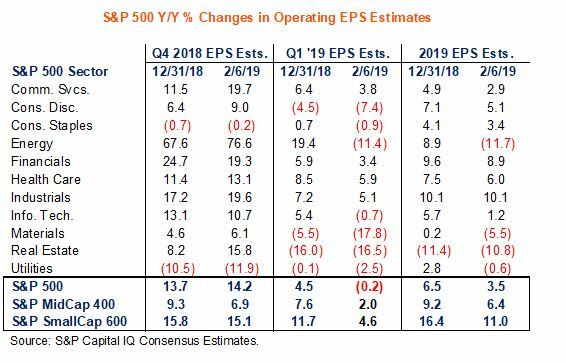 Earnings growth is expected to be negative for the first quarter and already reduced growth forecasts for the rest of the year could be cut in half. Earnings growth is expected to turn negative for the first quarter, and an already low growth forecast for the rest of the year could be cut in half, as companies continue to report fourth quarter profits. Fourth quarter earnings growth has been strong, at about 16 percent, but companies are guiding lower when it comes to 2019. The first quarter is now expected to see a decline of 0.25 percent in profits., according to S&P Capital IQ. Sam Stovall, chief investment strategist at CFRA, said if history is a guide, the revisions for 2019 earnings should continue through the end of the first quarter. That could cut S&P Capital IQ's 2019 earnings growth forecast to just a 1.5 percent gain. FactSet, which also compiles analysts' estimates, has been forecasting a 0.8 percent decline for the first quarter. Full-year estimates are well below what they were in September, he notes. "We were expecting them to be up 10 percent, and now it's more like 3.5 percent and falling, but the market is higher," Stovall said. The reasons for the disconnect between profit expectations and the market could be explained by the Fed, which is on hold from cutting rates and could potentially hike them, and a view held by some investors that the trade war will not last all year, he said. Stocks fell sharply Thursday after a White House official said the U.S. and China trade negotiators are not close and that there are currently no planned meetings between President Donald Trump and China's President Xi Jinping before the March 1 deadline. Negotiators meet again in Beijing next week. So far, the fourth quarter earnings season hasn't been a major problem for stocks, despite the daily decline in the outlooks. "The reasons investors might be ignoring the reduction in earnings estimates is it's related to China, and that could turnaround if some sort of trade agreement is announced," said Stovall. All 11 of the S&P major sectors have seen downward revisions to earnings estimates. "We're also looking for earnings to go negative for energy, materials, real estate and utilities in 2019, and of those just real estate was supposed to show a year-on-year decline," Stovall said. Analysts say the big drop off in earnings growth forecasts, after 2018's roughly 23 percent profit growth, has to do with the fact that corporate tax cuts boosted earnings growth last year. Credit Suisse analysts estimate the tax law changes contributed 7 percent to 8 percent of profit gains in 2018. But the analysts also said some aspects of the tax plan that could be accounted for just temporarily in 2018, actually acted like a drag, taking away 1 percent from earnings growth in 2019. The Credit Suisse analysts also say the decline in profit forecasts for the overall S&P 500 is being overly influenced by some big stocks that previously had strong earnings growth. The list includes oil giants Exxon Mobil and Chevron, but also Apple which is expected to see a decline of 12 percent in first quarter profits, compared to a 40 percent jump in third quarter results. In the last few days, forecasts for the first quarter began to turn negative. "I think it's concerning, but it just speaks to the pace of growth slowing. Energy accounted for the majority of the Q1 markdown," said Keith Parker, global equity strategist at UBS. He said energy is expected to decline 8 percent in 2019, and he sees profit growth of about 5 percent for the year. If profit growth does decline in the first quarter, it would be the first time since 2016's second quarter. Parker said the earnings beats for the fourth quarter are also coming in smaller than they had been, and the smallest since that same quarter of 2016. "We were expecting a 2 percent type beat, and it's coming in slightly below...The median surprise has been 1.3 percent," he said. It would be a bigger concern, if the expected decline in profits widens and spreads to other quarters this year. "To the extent you're seeing profits turn slightly negative, then the narrative of corporate investment being a potential engine for growth just becomes much more difficult," he said. "If they have less profits to spend, they will probably spend less." Michael Arone, chief investment strategist at State Street Global Advisors, said the lowered profit outlooks are a result of the slower global economy and corporate executives' uncertainty about it. "I think corporate executives are unnerved by the long list of things that have a very uncertain outcome," he said. Arone said in addition to trade, they are concerned about Brexit, China's economic slowdown and the political fighting in Washington, which resulted in the government shutdown. "We know executives lower the bar just low enough so they can beat year-over-year. Growth has come to a stand still. The market was oversold in December...Now in this very quick rebound, stocks are pretty close to fairly valued. I think it's going to be choppy or a volatile market through the balance of 2019. It doesn't mean stocks can't rise. It's just likely as these different scenarios play out, the uncertainty is likely to result in more volatility." Arone said the earnings growth slowdown does not suggest a recession is coming, but the market could start to worry more about earnings growth. In the last period of negative profit growth in 2016, the market didn't really care. "The difference this time is there's a growing uncertainty around a number of things...The economy was accelerating or expected to accelerate at the time," he said. "Here you have a contrast to that." Companies that focus outside the U.S. are the ones that are affected the most, he said. "Domestic growth seems to be okay. Anyone tilted toward the U.S. consumer and domestic U.S. growths seems to be okay. Large multinationals are exposed to the global economy, trade friction and tighter monetary conditions," he said.